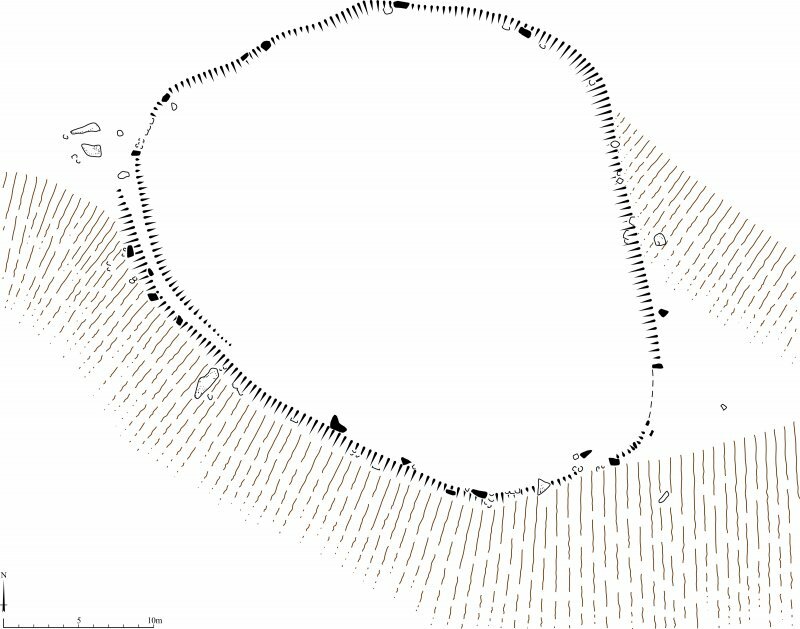 Publication drawing; stone circle, Pobuil Fhinn. View of stones on SE with Mr Stratford Halliday, RCAHMS. View from SW showing stones in NW quadrant. Plane-table survey and profiles, Pobull Fhinn. Poball Fhinn (Finn's people), possibly 2nd millennium bc. 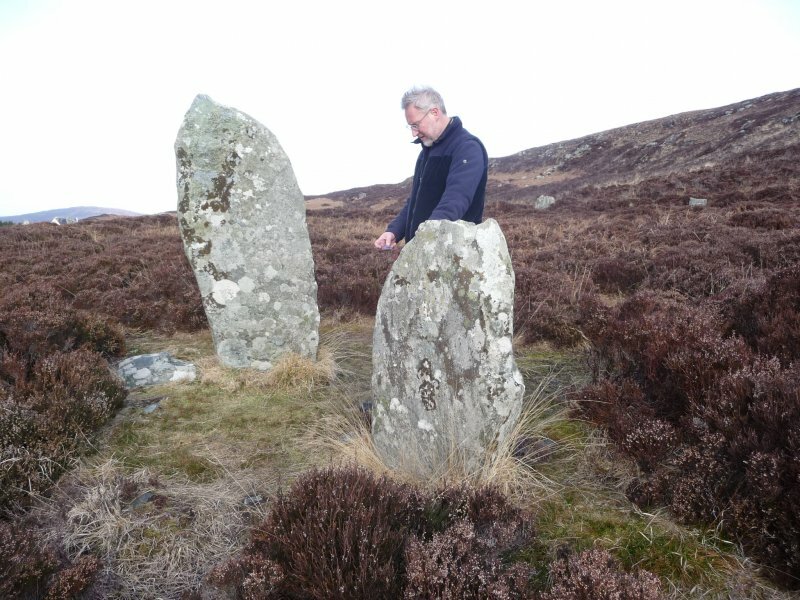 A little-disturbed oval ring of weathered stone slabs, standing upright or fallen on a saucer of ground terraced into the hill above Loch Langass. 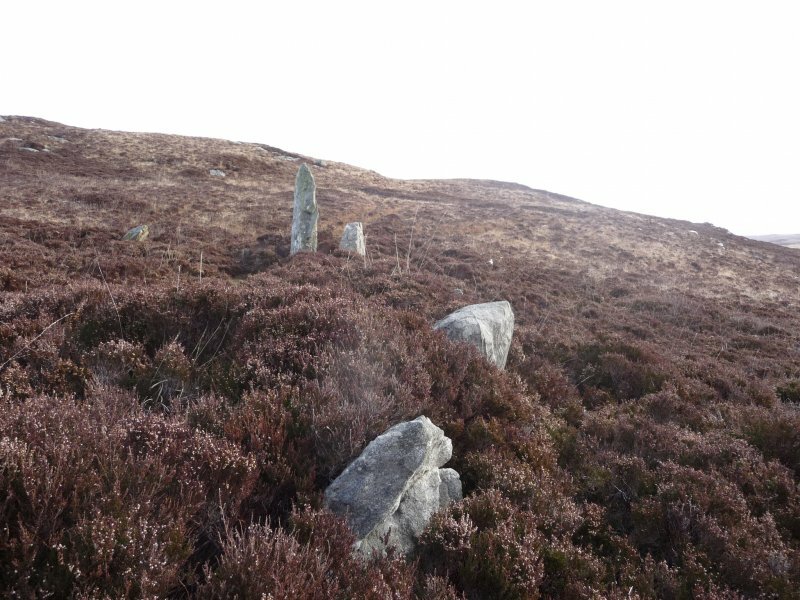 This stone circle is known locally as Sornach Coir' Fhinn. 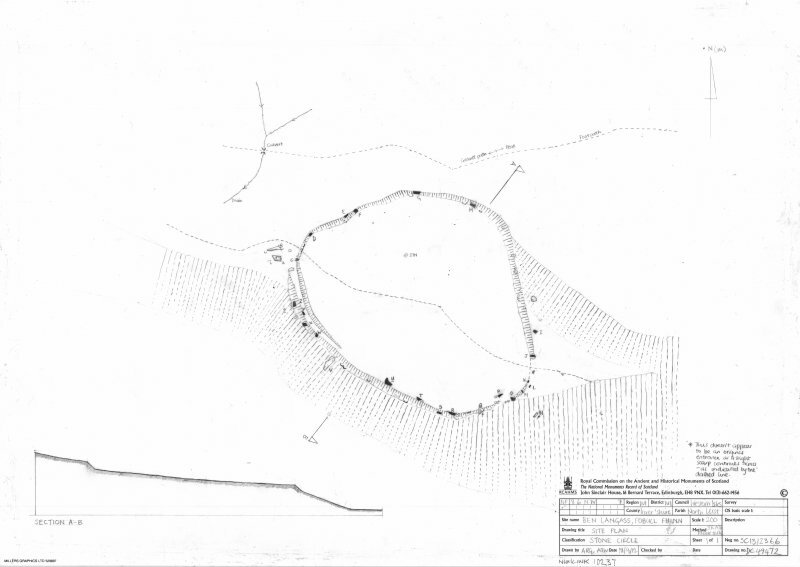 The OS 6"map, 1903 erroneously applies this name to another circle (NF86SW 28). The circle is oval, being 122ft E-W and 100ft N-S. The enclosed area has been partly levelled by excavation to a depth of 4ft on the N side, and a slight bank of earth with some stones in it has been erected along the southern side on the edge of the plateau and round the ends. The standing stones generally are placed on the outer edge of this bank and against the face of the slight scarp on the northern side. About 24 erect stones and boulders can be counted in the ring of the circle, eight on the northern and sixteen on the southern half, but a considerable length of the NE segment is devoid of stones. 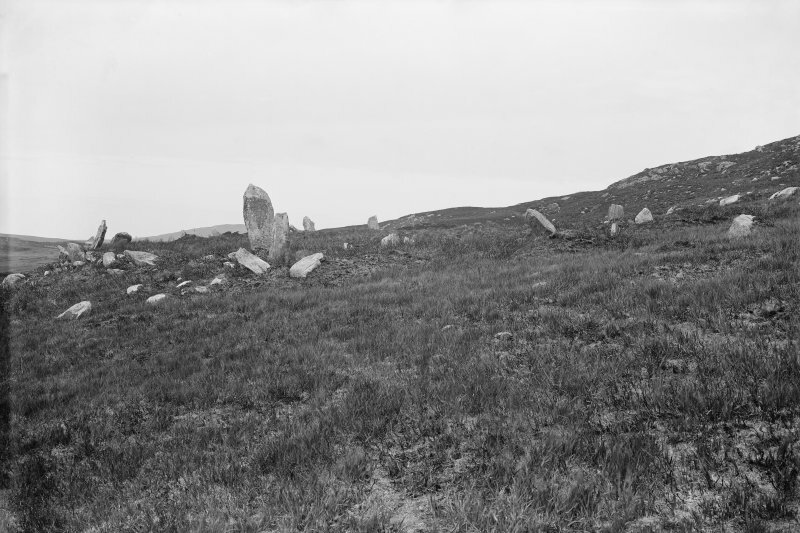 Pobul Fhinn is generally as described by the RCAHMS, the eight stones on the northern half being the most prominent although there are 23 others. A wall on the north side is no more than 0.5m high and 0.3m thick and may not be contemporary with the circle. Neither name could be authenticated locally. NF 84270 65020 An archaeological watching brief was carried out during the creation of a new pathway at the stone circle of Poball Fhinn. No features of archaeological significance were observed during the excavation of the path foundations. Excavation of the first culvert, to a depth of 320mm, revealed shallow peat deposits and exposed the underlying geology at at depth of 160mm. Elsewhere the shallow depth of excavated material (c.250mm) meant that little information was gained about the depth of the peat across this area. The path was created without damaging any archaeological deposits. significance were found during the excavation of the four gravel pits. 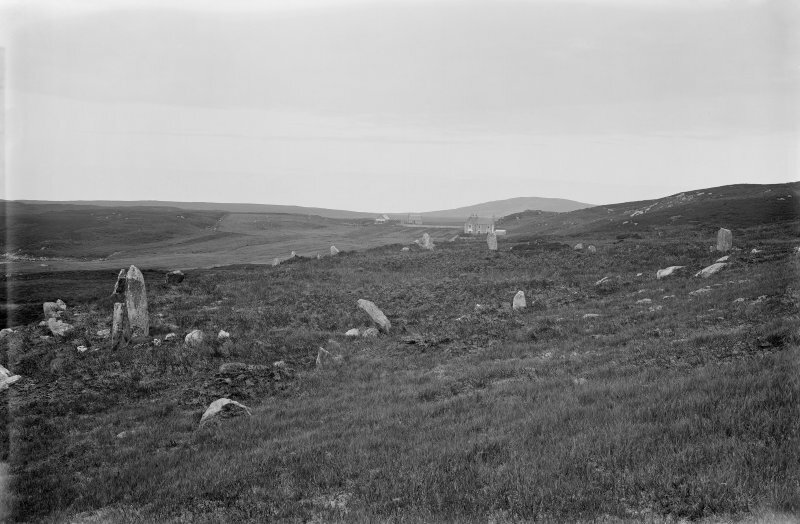 This stone circle, which stands at the SE end of a terrace overlooking the W end of Loch Langass from the NE, is generally as described by RCAHMS in 1928. Oval on plan, its interior is levelled into the gently sloping surface of the terrace, and the excavated material seems to have been used to build the bank in which the upright stones of the circle are set. On the SSE, the taller ringstones stand along the inner edge of the bank, which also has an external kerb. Without excavation it is impossible to determine the relationship between the stones of the circle and the bank of the enclosure. Two fallen stones lie outside the circle on the SW.
the ‘eighth’ divisions of the Thom solar calendar, namely the first and last Quarter Days of the year – at the beginnings of February and November respectively. Some useful points emerge from this new discovery. First, how many more such long alignments, visible only in clear weather, await discovery? A Thom and CLN Ruggles between them have surveyed more British standing stone sites than anyone else, but they rarely comment on the weather at the time of the site visits. Obviously if a distant peak is recorded it must have been clear but it is unlikely to have been equally good when all the sites shown having only near horizons were surveyed. With present climatic conditions it must often be a matter of luck whether a vital distant peak is seen during a short visit. The second point is that investigations of the astronomical qualities of standing stone sites should be a little more flexible. The irreducible requirement must remain of course: to be plausible a celestial alignment must include a direction indicator of some kind in the backsight which points at the horizon foresight. However, as with Sornach Coir Fhinn the landscape itself could often be giving us important clues about what the circle builders and stone erectors intended. There the distant mountains in Skye, framed between local hills, seemed an obvious potential sunrise foresight and an examination of the site plan showed that this direction was indeed marked. 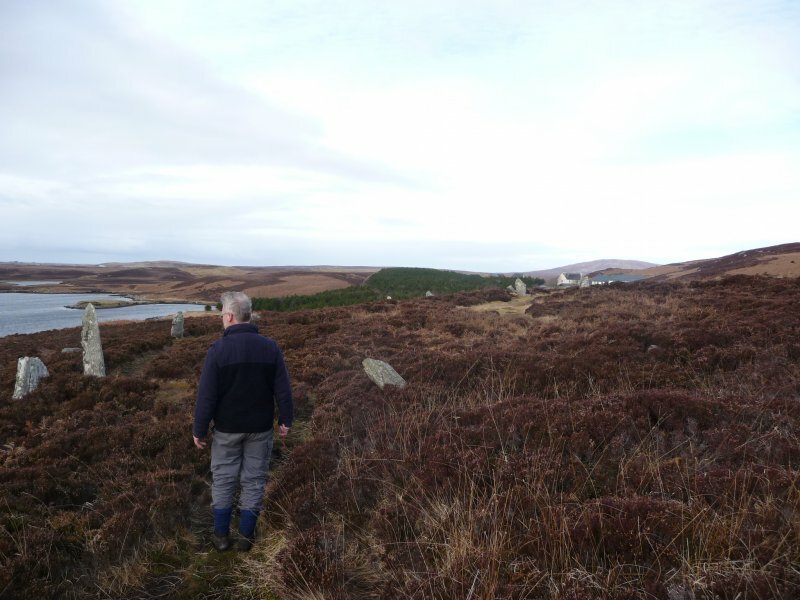 The third point is that the discovery of the rarely visible yet indicated Glamaig sight-line surely points again to a better climate and clearer air in Neolithic times. Other rarely seen long sight-lines suggest the same, like those to Boreray in the St. Kilda group. The literature on the climatic deterioration in Britain between the middle Bronze and the Iron Ages is large but an essential point is that peat is repeatedly found to have grown over Highland archaeological sites of these earlier periods, marking the onset of wetter and cooler weather. 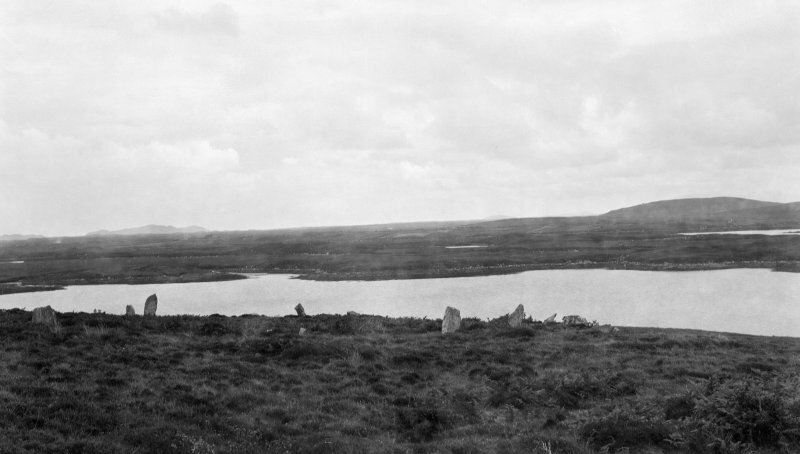 A local example is Callanish in Lewis the stones of which were originally half submerged by about 5ft of peat. It simply will not do to argue from present atmospheric conditions that long alignments are implausible. 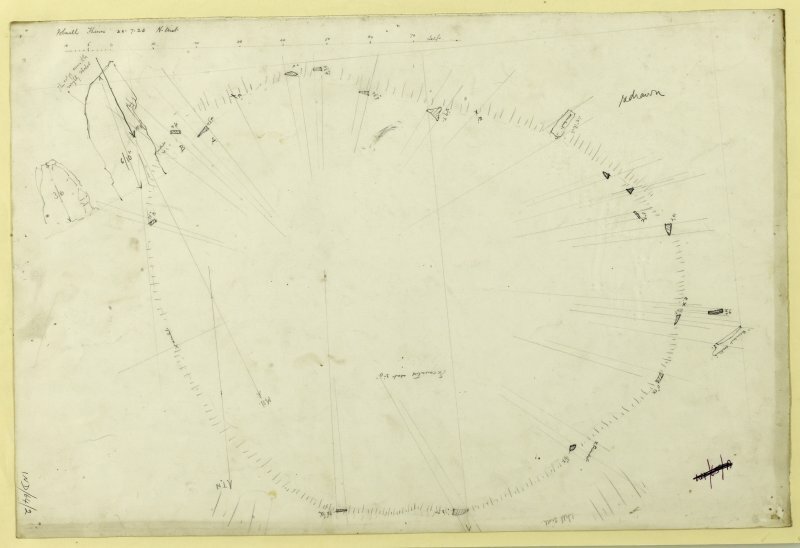 RCAHMS 1928 Ninth report with inventory of monuments and constructions in the Outer Hebrides, Skye and the Small Isles. Edinburgh. 83, No 250.
sites, Brit Archaeol Rep 123. Oxford. 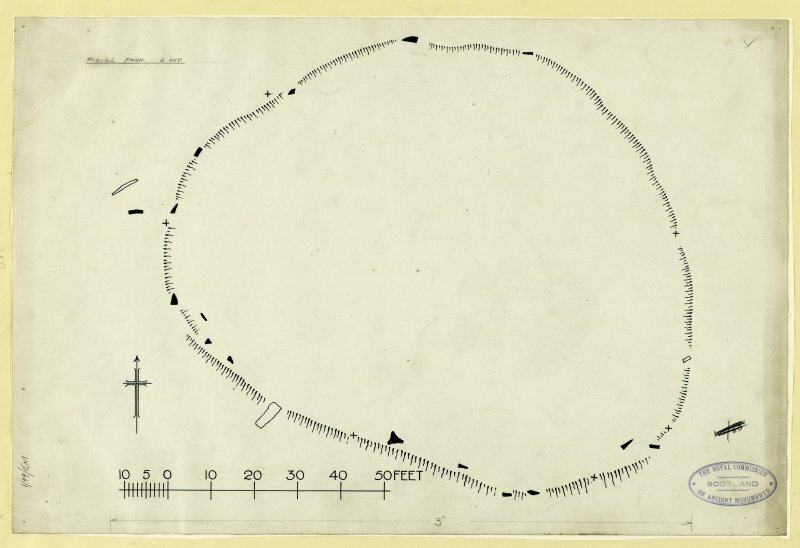 Thom, A, Thom, AS and Burl, HAW 1980 Megalithic rings: plans and data for 229 monuments in Britain, Brit Archaeol Rep, 81, Oxford.